Robert Brindley's Blog: Happy 86th Birthday Queen Elizabeth! 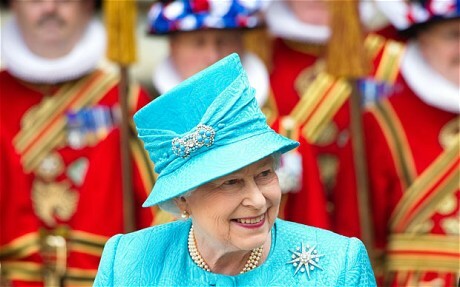 Queen Elizabeth will be celebrating her 86th birthday on Saturday 21st April. The Queen was born at 2.40am on 21 April 1926 She was the first child of The Duke and Duchess of York, who later became King George VI and Queen Elizabeth. She celebrates two birthdays each year: her actual birthday on 21 April and her official birthday on a Saturday in June. Her Coronation took place in Westminster Abbey on 2 June 1953. It was a solemn ceremony conducted by Dr Geoffrey Fisher, Archbishop of Canterbury. The Queen and The Duke of Edinburgh have four children: Prince Charles, The Prince of Wales (b. 1948), Princess Anne, The Princess Royal (b. 1950), Prince Andrew, The Duke of York (b. 1960), and Prince Edward, The Earl of Wessex (b. 1964). She has delivered a Christmas message every year except in 1969, when she decided the royals had been on TV enough after an unprecedented family documentary. Her greeting took the form of a written address. The Queen issued a writ against The Sun newspaper after it published the full text of her 1992 broadcast two days before transmission. She later accepted an apology and a £200,000 donation to charity. She is the only person in Britain who can drive without a licence or a registration number on her car. And she doesn't have a passport. Queen Elizabeth II is the fortieth monarch since William the Conqueror. The Queen introduced a new breed of dog known as the "dorgi", when one of the corgis mated with a dachshund named Pipkin. The Queen is 5ft 4 inches or 160cm tall.